The Tampa Bay Lightning are a tough team to beat at home with a 17-5-2 record at St. Pete Times Forum. Winners of six straight going into this divisional battle with the Capitals, the Bolts were looking to put some distance between the two. But Nick Backstrom had other plans as his two goals propel the Caps to a solid win on enemy ice, 5-2. In a game that could play into post season positioning at the end of the year, the Caps' top line came to life. Backstrom had a four point night with a pair of goals (13, 14) and a pair of assists (35, 36). Alex Ovechkin was no slouch either scoring the game winning goal on the power play (20) and added up 3 assists (33, 34, 35) to boot for a 4 point night for himself. 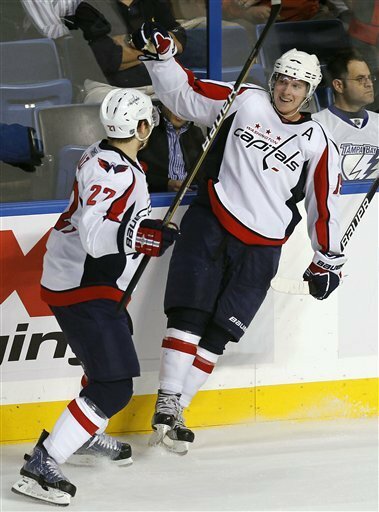 Brooks Laich (10) and an empty netter by Jason Chimera (8) rounded out the scoring for the Caps. From the onset, this was going to be a rough battle as both teams brought the physicality to open the game. The first four penalties the Lightning took were a pair of roughing calls followed by a pair of fighting majors. Matt Hendricks played another physical game getting into a fight with Bolt bad boy Steve Downie. Matt Bradley would also get into the fighting action with a tussle with Adam Hall. The Lightning strategy was to play "hands-off" hockey and clog the neutral zone. It was a strategy that played well against the Capitals in their last two wins against Washington. But the Caps were prepared just to lay back and take their time, not forcing the play up ice just turn the puck over. It would result in quite a few moments when the Caps' defense were holding the puck in their zone and letting the clock burn out as the Lightning sat back. When the Caps were able to break the neutral zone they made the most of their opportunities by getting quick shots to the net and funneling all the play there. The result was some golden chances off of rebounds and the Caps were able to clean up on the sloppy seconds. Down by one, the Caps strategy would work as Mike Green held the puck in the zone making a nifty deke to the inside and shot the puck in on Dwayne Roloson. The Bolt goaltender would make the first save, but both Ovechkin and Backstrom were there for the rebound. It looked as if Ovi had scored the goal, but on video review, they gave the goal to Backstrom. It is only his 13th goal of the season. The Caps would take the lead on the same strategy getting the puck to the net. After some board work, Mathieu Perreault and Jay Beagle would work the puck to the front of the net. Laich would get the biscuit in the slot and make a sweet backhander count, scoring top shelf over Roloson's shoulder. Ovechkin would get his 20th goal on the power play simply by picking his spot and letting go a wicked snap shot over Roloson's blocker shoulder. The power play tally would stand as the eventual game winner and put the Caps up 3-1. It wasn't all roses as the Capitals penalty kill, which has been a shade better than good, was tested one too many times against a good power play team in Tampa. They would let a goal in but also doused another three extra man attempts for Tampa. The Lightning would score in the waning moments of the second period to cut into the Capitals' lead 3-2 and seemed to have momentum go their way. But some smart goaltending by Semyon Varlamov kept the Bolts at bay. He would stop 23 shots and post a .920 save average. After he made a spectacular pad save, the Caps broke the action the other way and Ovechkin just had to put the puck on net. Roloson made the first save, but the puck bounced to the open slot and Backstrom was there to score his second goal of the night and to add some insurance with over seven minutes to play in the third period. Add a Jason Chimera goal to the equation (after Ovechkin gave up the goal for his third assist on the night) and the Capitals play a full game. It wasn't perfect at times, but they were able to rebound from an early soft goal and stifle the Bolts explosive offense. It helped the top line finally got some points on the board as well. If the Caps are looking to take back the Southeast Division lead, they need to play more like they did tonight. They need to play with passion, a physical edge, discipline and out work their opponents. The goals the Caps scored weren't results of pretty plays or cute passes, but more from just getting the puck to the net and jumping on loose pucks. This sets up another marquee match-up with the Pittsburgh Penguins on national television. The NBC broadcast will once again shine a light on the league's biggest rivalries. The Caps are looking to keep their winning ways going but will most likely play a Penguin team minus Sidney Crosby and Evgeni Malkin on Super Bowl Sunday. Alex Semin was slated to return to the lineup for tonight's tilt with the Lightning, but instead stayed in D.C. still nursing a groin injury. Chimera made a return to the top line next to Backstrom and Ovechkin. The strategy seemed to work as Chim's speed opened some space for both of his linemates. He would finish with a goal and an assist and a plus 2. The Capitals ended their 139 minute, 31 second stretch without a goal against Tampa Bay Lightning. They have been shut out in the last two meetings. In fact three of the last five games Tampa and Washington have played included a shut-out (two by the Lightning, one by the Caps). Backstrom would get the game's first star of the night, Ovechkin the second.